Though times are tough, there are many homeowners who have been thinking about making changing in their homes, more specifically their kitchens. Kitchen faucets are one popular place to start. Most homeowners look to make their kitchens more modern. It can get rather expensive but we can offer you five kitchen faucets for under $ 100.00. These are not just from some fly by night company; these faucets are from top-notch companies like Delta, Moen, Kohler, Price Pfister and GERBER. When you land on a website, you most likely see the most expensive models there. But you really have to look deep into the site to find these types of faucets. When you land on a faucet website, they usually list their products by categories or Series. You will have to check out more than a few different faucet series in order to find that less expensive faucet you have been looking for. 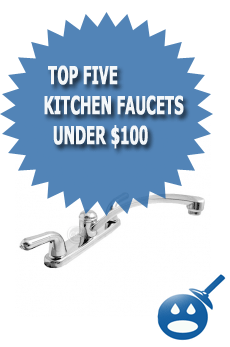 We have done just that and now we present five kitchen faucets for under $100.00. We fully understand how confusing it can be trying to compare one model to another. Not all faucets are the same either, for example just because the faucet looks like its made of of brass does not mean it is actually brass, it could be just a brass coating or other metals made to look like brass. In our top five faucet guide below we will explain and help you understand what all of this means, and you will be a smart plumbing faucet shopper in no time. Delta is one of the most recognized names in the world of plumbing fixtures. When you hear the name Delta you think of faucets and you think of quality. 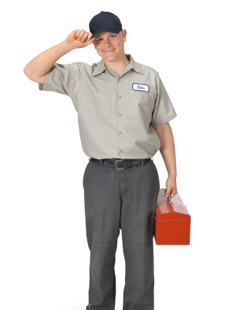 Delta has been serving the plumbing industry for over 100 years. They are dedicated to bring you high quality, dependable and long lasting products. Their full line of Kitchen Faucets is impressive and the majority of their faucets are over $200.00. You have to really search if you want to find a bargain when it comes to Delta Kitchen Faucets. One of those impressive faucets we mentioned is the Delta Classic Two Handle Kitchen Faucet, Model 2100. This traditional yet modern version of the kitchen faucet is priced under $ 100.00. This faucet will look great in any kitchen decor; it has a 3-hole installation with a flow rate of 8.30 lpm. The Delta Classic Two Handle Faucet is a washerless stem cartridge design keeping in step with today’s technology. This faucet has a 9″ long spout that swings a total 360 degrees for better cleaning of deep pots and pans. The handles are easy to grip blade handles with a classic look with a contemporary style. The faucet is a solid brass construction and is available in a Chrome finish. Some benefits of the Delta Classic are that their hot and cold stems are interchangeable. With the Classic Two Handle Faucet there are other attachments available if you want to spend a little extra money. You can purchase soap dispensers and a vegetable sprayer hose. The Classic Two Handle Kitchen Faucet from Delta are easy to install and they are made to last. Kohler is one of the most popular names in the business of plumbing fixtures. They have everything from showerheads, bathtubs, bathroom faucets and kitchen faucets. Kohler’s products are durable, high quality and they were designed by the best engineers in the business. Kohler has been in business for over 100 years. Like other kitchen faucet companies, they do have some high-end styles of faucets. Generally their prices are over $ 250.00, but homeowners really want to upgrade their kitchens with Kohler products but often get discouraged because the higher priced items are the first products you see. But like with Delta, you have to look deep enough and you not only will find some great innovative styles but also reasonably priced under $100.00. One kitchen faucet from Kohler is from the Coralais Kitchen Sink Faucet. The style is traditional yet up to date. The Kohler Model K-1521-CP is styled with a sleek new design with ergonomic handle rotations that can turn on and off the water with a simple quarter turn. Perfect for those with arthritis or weak hands. The faucet is available in Polished Chrome. One of the features of the Coralais Kitchen Faucet is that there are interchangeable handles if you prefer something with lever handles (K-15251-B or blade handles (K-15251-4). 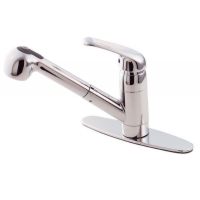 The faucet is constructed with all metal that will provide the product with long life. The Kohler kitchen faucet offers a one-piece ceramic valve that works to prevent the faucet from corroding and from getting water sediment from building up. This Kohler Coralais Kitchen Faucet is priced under $100.00. It has a classic sleek style. It will look perfect in any kitchen and it is easy to install. 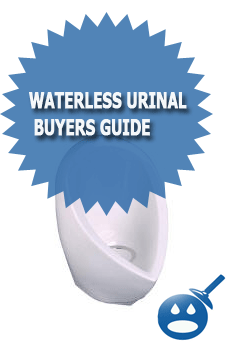 Kohler products are available in most local plumbing supply stores. Delta and Kohler have been part of the top three companies along with Moen in Kitchen Faucets and other plumbing fixtures. They all have great styles and great designs. But some people will choose one company over the other. Let’s compare the Delta Classic Two Handle Kitchen Faucet and the Kohler Coralais Kitchen Faucet. Some differences in the two faucets are that the Delta Classic is made from a solid brass construction and the Kohler is made from an all-metal construction. The Delta Faucet is made from a washerless stem cartridge and the Kohler uses a one-piece ceramic valve. The Kohler faucets are easily usable and can turn with a slight quarter turn and if you do not like the handles you can order lever handles or blade handles. Each company is well known and each offers only the best of the best. Some homeowners prefer washerless systems to ceramic and others enjoy options of the standard faucets do not come with the style they like. If you are not sure if Delta or Kohler has what you are looking for then please read on. Price Pfister is also one of the top plumbing fixture companies in the business. They along with Delta and Kohler offer their customers the very best products made with high quality materials as well as innovative designs. Price Pfister has an impressive inventory of some nice kitchen faucets. But like the other plumbing fixture companies they place their higher priced products out there first. That is why many people end up with fixtures they cannot afford; they simply don’t take the time to find those fixtures that are within their budget. But for those smart shoppers, they find some great deals starting with the 538 Genesis Pull Out Kitchen Faucet. This style of faucet comes with a deck plate complete with tie downs for easy installation. The faucets is made from solid brass construction meaning that it is made to last. The Genesis 538 Series come with a stainless steel ball valve construction and a stainless steel pull out hose. This faucet has a classic style but a new sleeker design. The faucet’s design is a ceramic disc valve with a 1 or 3-hole installation. The Genesis 538 Series comes with a step-by-step installation instructions and a Pfoever warranty. These faucets are stylish and will look great in your kitchen. The best part of the Genesis 538 Kitchen Faucet is the price. You can find Price Pfister Kitchen Faucets in your local plumbing supply house or retail store. Moen is perhaps the most well known out of all of the faucets we have listed here today. Moen is the number one choice among most homeowners for their plumbing fixtures. The company is best known for their superior products, their cutting edge technology as well as their dedication to customer service. Moen has been in the business for many years and their products are the most innovative and the most modern styles that other companies just don’t offer. Due to the designs and what these faucets can do, Moen’s inventory can be pretty high-end. But if you search the site enough you will find kitchen faucets for under $100.00. One of those faucets is the Chateau 7445 One Handle Kitchen Faucet. This faucet will fit easily on any 3-hole sink installation. The length of the spout is 9″ perfect for easy cleaning and prep. The Moen Chateau 7445 One Handle Kitchen Faucet has a dependable one-piece washerless cartridge. The handle is smooth and is available in a Chrome finish. The faucet’s aerator is limited to 2.2 gallons per minute. The temperature controlled by a 180-degree arc and the faucet will operate with less than 5 pounds of force. Making this faucet one durable faucet. The Moen Chateau 7445 has a limited lifetime warranty that protects against leaks, drips and will protect the finish from corrosion and rust. The construction is a metal construction with a chrome finish. The connection is a 1/2″ IPS and will work best with a 3/8″ tubing connection. Moen faucets have a look of elegance but a modern flair that will look great in any kitchen. Many people may not be familiar with the name GERBER when it comes to plumbing fixtures. But they company has an extensive inventory stemming from kitchen, bathroom, prep and laundry faucets to single and two handle faucets. Often when we are looking to improve our home, we usually start with the kitchen. The faucets are usually the first ones to go. As we mentioned early on that the plumbing fixture companies are always looking to try to sell the most expensive styles first. But all you have to do is the research and you will find that the websites have some ” hidden” faucets priced just under $100. One of these faucets is the Brianne Two Handle Kitchen Faucet. Model Number 42-706 offers a traditional yet modern style faucet along with brass waterways. The GERBER Brianne Two Handle Faucet has a ceramic disk cartridge but the faucets streams better water flow unlike other faucets that spray more than stream. The GERBER Brianne offers three different finishes, the Chrome, Stainless Steel and the Oil Rubbed Bronze Finish. By saving money on the Brianne Two handle Kitchen Faucet you may want to invest in a side spray feature. These are terrific for food prep and for easy cleaning. All of these faucets that we have mentioned here are all priced at lower than $100.00. With homeowners trying to save money, you can still get a great looking faucet at great prices. Just because you spend a lot of money doesn’t mean you are getting a great deal. With these 5 kitchen faucets you have a choice of one-piece washerless cartridges like the Moen and Delta or the one-piece ceramic valve like Kohler and GERBER. Each faucet has some great features in their own right and depending on what you are looking for the choice is yours. Looking for a two handle, “stainless” kitchen faucet for under $100.00. Is this possible????? ?